The Museu Nacional has a large collection of drawings, prints, paintings, medals and sculptures by Ismael Smith, a Catalan artist of the first half of the 20th century. 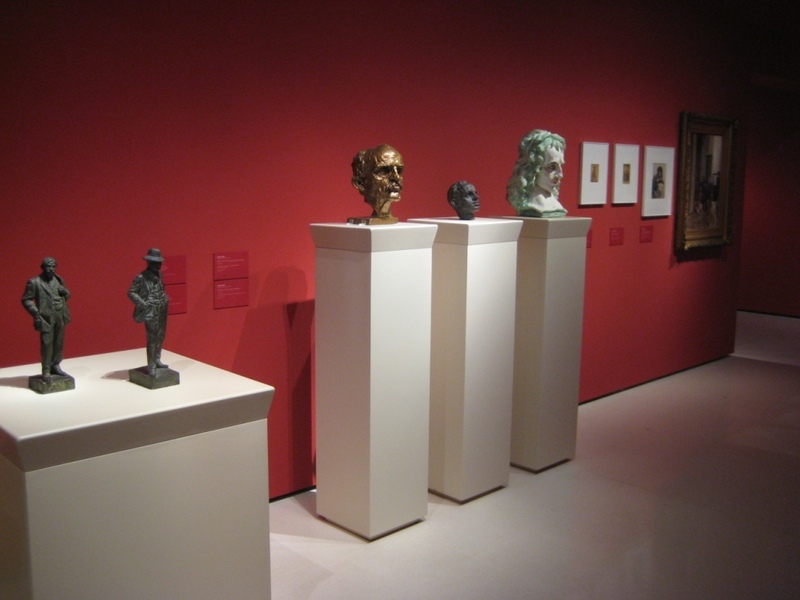 In September 2014 the museum’s new display of Modern Art entailed the restoration of some hitherto unpublished works by the sculptor. 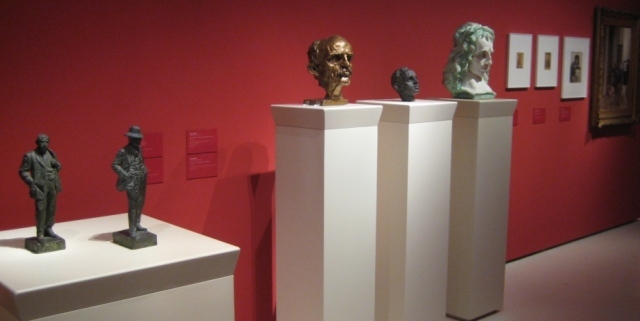 They are three plaster casts made from a mould, two with polychromy, Encarnació and Literary Figure, and one with an artificial gilt-bronze patina, Portrait of a Man. Thanks to the process of restoration we have been able to learn more about the techniques and materials used by the artist and, at the same time, recover a clearer reading of the work and of its polychromies. The figurine Encarnació was in an average state of preservation. Deposits of dust and dirt had accumulated on the non-vertical surfaces, the head was broken off at the neck and much of the right foot was lost. The head of Literary Figure, although it was in a better state of preservation, was very dirty and covered in large deposits of dust and dirt stuck firmly to the plaster support. In both cases the cleaning was done with an aqueous system based on an agar-type jelly applied hot, in a thin layer to keep the amount of water on the plaster and the polychromy to a minimum. 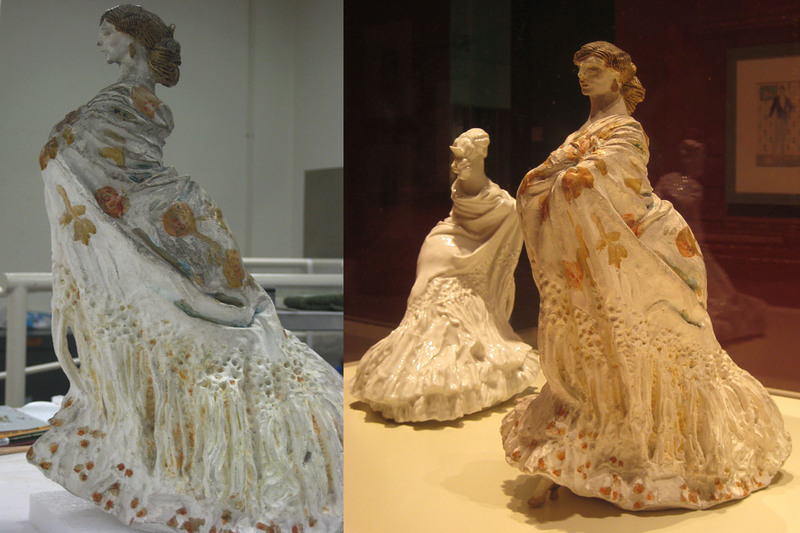 In the case of Encarnació, moreover, the fragmented parts were strengthened and the right foot was replaced, using the porcelain version conserved in the museum as a model. 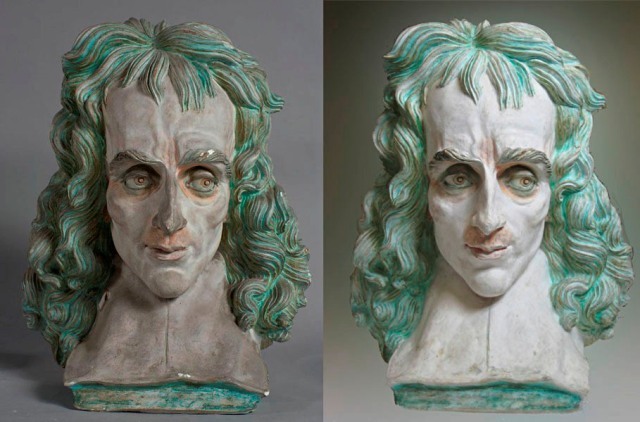 On the metallic patina of the gilded head Portrait of a Man, there were still traces of glue and clay from the gelatin mould made in the foundry during the execution of the bronze version, which is also conserved in the museum. During the cleaning, also done with an aqueous system, these traces were reduced so as not to interfere with the reading of the sculpture’s volumes. The chemical analyses with the scanning electron microscope (SEM-EDX) and FTIR spectroscopy, done by the Restoration and Preventive Conservation laboratory, have enabled us to identify both the pigments and the agglutinants of the polychromies and the artificial patinas applied to the plaster. The polychromies are almost always done in oil paint and with a range of pigments in keeping with the period when the sculptures were polychromed. 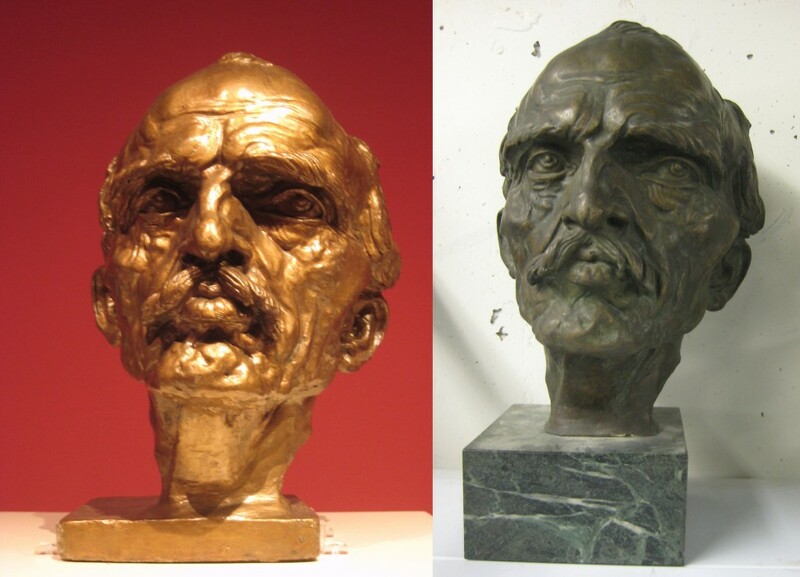 The imitation-bronze artificial patinas were done using metallic paints with an organic agglutinant. The 4thConvegno Internazionale sulle Gipsoteche: il valore del gesso come modello, calco, copia per la realizzazione della scultura, held at the Museo-Gipsoteca Canova in Possagno (Italy), was an excellent opportunity to talk about Ismael Smith’s plaster sculptures for the first time in Europe. The Museu Nacional participated with a presentation entitled La scultura in gesso di Ismael Smith: modelli, policromie ed opere definitive. There I talked about the multiple functions that plaster sculptures fulfilled in the sculptor’s creative process, whether as models for later ceramic or bronze versions or as true finished works. The way in which the sculptor, through the polychromy, managed to transform the plaster into a final material was analysed and it was suggested that, thanks to this characteristic so typical of modernity, Smith unequivocally became a member of the figurative avant-garde of his day. Born in Barcelona in 1886, Ismael Smith was a versatile, eclectic, free and very personal artist, somewhere between Modernisme, Noucentisme and Art Deco. He was heavily influenced by artists such as the English draughtsman Aubrey Beardsley or the German sculptor Wilhelm Lehmbruck. Part of his professional career, especially as a bookplate and medal maker, took place in the United States. He died in 1972 in New York. His sculpture output is made up mostly of small-format plaster casts. The versions of some of them in the final material are conserved too. The plaster casts include models designed to be reproduced in ceramic, and others that have acted as the transition between the original model and the final bronze. The series of his works in porcelain and stoneware were produced at Antoni Serra’s Porcelain and Artistic Stoneware Factory in Barcelona. A large part of this collection entered the museum in 1955 as a result of a donation made to the museum by Smith himself. The rest arrived in 1989 thanks to Enrique García-Herraiz, who had been the trustee of Smith’s entire collection, conserved by his brother Frank in the USA. Many of the works have been in the reserve since then. An exhibition devoted to Ismael Smith has been planned for the near future at the museum, curated by Josep Casamartina. It will be a good opportunity to learn more about his work.